Technically, yesterday was Inauguration Day, but because it fell on a Sunday the big ceremonies are happening today. Presidential inaugurations are a large part of American history. However, there are a lot of really interesting things that go on behind all the pomp and circumstance. There are also a lot of really, strange, improbable, and even bat-crap crazy things that happen as well. President Washington delivered the shortest inaugural address, during his second inauguration, at only 135 words. However, his wife Martha's diary records that he "blathered like a schoolgirl all the way down the parade route, mostly complaining about the wedgie his presidential suspenders were giving him." The Marine Band has played at every inauguration since Jefferson's first, at which they played a variety of show tunes. James Madison was the first president to have an inaugural ball. There was also a dance afterward. John Quincy Adams was the first president to wear long trousers at his inauguration, instead of breeches. What most people don't know is that this was to cover up the large number of gang tattoos on his shins. President William H. Harrison is remembered for giving the longest inaugural speech, at 8,445 words, in the cold and wet, and dying of pneumonia a month later, moments after he finished the speech. What is little known is that Harrison began Inauguration Day by taking a polar bear swim in the Potomac, an ice bath in the Capitol spa, and drinking two straight pitchers of iced Bourbon, on a dare by his Vice President John Tyler. James K. Polk's inauguration was accompanied by a major advertising campaign for the egg industry. Inauguration attendees were heard to mutter the slogan "Polk loves yolk!" all evening. During President Lincoln's first inauguration parade he stopped no fewer than three times to wrestle hecklers, winning all three matches (two pins and a submission). President Grant's second inauguration was the coldest ever, as the temperature dropped to 16 degrees Fahrenheit. During the parade, Grant skated from the Capitol to the White House, pulling off a number of double axels along the way, to the delight of onlookers. President Grover Cleveland's inaugurations were complicated by the secret fact that there were two Grover Clevelands! 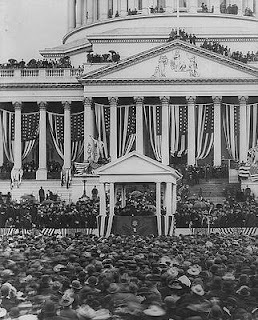 Theodore Roosevelt's inauguration was non-descript as far as the public was concerned. However, upon reaching the Inaugural Ball, he yelled, "Charge!" and raced into the room, impaling the Senate Majority Leader's wife with his walking stick. Doctors ascribed the odd behavior to "too many bonks on the head during safari." President Harding was the first president to ride the inaugural parade route in an automobile. There was a car for President Harding and his wife, and a car for each of his twelve mistresses. President Coolidge's inaugural address was the first broadcast by radio. However, due to the literal nature of Coolidge's nickname, "Silent Cal," the address was delivered by a young impressionist, Rich Little. President Franklin Delano Roosevelt had four inaugurations. He drank a full bottle of Scotch before his first one and added a bottle to the ritual for each of the successive inaugurations. This explains the famous line from his fourth inaugural address (excised from films and recording), "Weasels! Weasels crawling all over me!! Get 'em off!!!" President Eisenhower played a full three rounds of golf *during* his second inauguration ceremonies. He started strongly, playing even par for the first round, but it all fell apart during his speech, as he took a twelve trying to play through the Chief Justice's entourage. President Kennedy espoused his own version of the Monroe doctrine during his inaugural address. This explains the unusual number of references to the Lincoln Bedroom and "Maryland." President Nixon finished his second inauguration by having Vice-President Spiro Agnew pistol whipped with a Baretta, but it was only because he thought Agnew was George McGovern and had sneaked into the Inaugural Ball. President Ronald Reagan simultaneously gave his inaugural speech while warding off a massive extraterrestrial invasion. His speech was coded so that it relayed the following message in the alien tongue: "We will nuke your ***." The alien vessels turned back before they even reached Jupiter. President Clinton's inauguration was noted for a special ceremony at the Oval Office desk, underneath which there were no fewer than fourteen interns. President Obama's first inauguration had several little known milestones, including the first inaugural basketball dunk, and the first time a Vice Presidential toast included the words, "And if you screw this up Joe, so help me, I will take you out with a Predator drone."